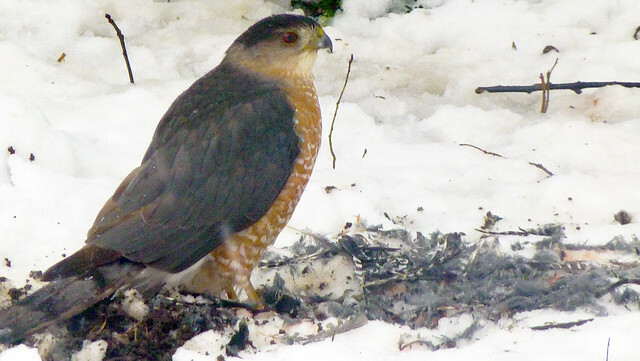 My parents had a back yard treat last month — a Cooper’s Hawk having lunch in the snow. 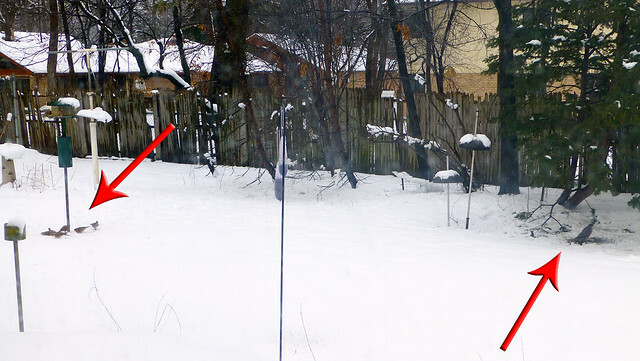 Look at how the Mourning Doves on the left side of the below photo aren’t bothered at all (actually I would guess they are totally oblivious) as the Cooper’s Hawk eats away on the other side of the yard. I think the prey item is a Hairy or Downy Woodpecker based on the striping on the plucked feathers. It’s not a Mourning Dove… maybe that’s why the other doves didn’t head for the hills? Here’s a short video of the Cooper’s Hawk with its lunch. This entry was posted in Illinois, Yard Birds. Bookmark the permalink.